The population of some 787,000 is expected to grow to above 800,000 by 2023, with 70 per cent aged over 70. 7.8 per cent of the population live in the most deprived areas of England and life expectancy for men varies by more than 11 years. More people are living longer with long-term conditions. ‘Our Dorset’ wants to change the system to provide services to meet the needs of local people and deliver better outcomes. The ambition is to see every person in Dorset stay healthy for longer and feel more confident and supported in managing their own health. Find out more at www.dorsetsvision.nhs.uk. 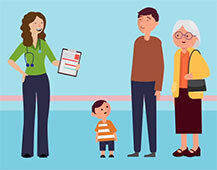 A number of programmes will close the gaps in health and wellbeing and lead to improved health outcomes, a better patient experience, the same standard of care across all health and care settings, more choice about when and where to receive treatment and less time travelling to attend appointments. Digitally-enabled Dorset will increase the use of technology. Joined-up care at the Weymouth Community Hub in Dorset improved the lives of Dennis, who suffered from multiple complex conditions, and his wife Jennifer, who cared for him. Dennis had a series of falls, suffering a number of serious injuries, and his health went downhill very fast. The community hub brings together a number of services that were able to support Dennis and Jennifer, with individual staff engaging the services of the rest of the team to solve the problem. Sadly, Dennis has passed away since the film was made.